An alleged international hacker and his four companions were arrested during a recent police raid in Barangay Taculing in Bacolod City. Found inside the house of the suspect identified as Peter Locsin were various kinds of fake credit cards and licenses, according to a report aired Friday on ABS-CBN's morning show "Umagang Kay Ganda." Locsin has been in the watchlist of the Federal Bureau of Investigation in connection with bank fraud cases in the US. Aside from the credit cards, police recovered an M4 assault rifle, a shotgun, two caliber-22 pistols and hundreds of bullets, the report said. A pouch of marijuana hidden in the playroom of the suspect's residence was also uncovered. 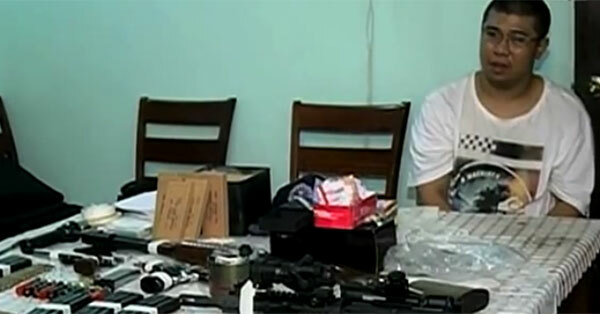 According to the cops, the raid was conducted after Locsin's neighbors complained that he was carrying high-caliber firearms. Police also arrested 4 men who were inside the house of the suspected international hacker.